The masterpieces of classical Russian paintings from the collection of State Museum of Fine Arts of the Republic of Tatarstan arouse great interest everywhere they are exhibited. Not only the citizens of Kazan but plenty of tourists and guests of our beautiful city, which stands on the bank of the Volga, do their best to visit the Art Museum, to see its treasures and to be aesthetically impressed by them. The exhibitions and just single pieces of art from our museum were often and very successfully on display abroad - in Holland, Italy, Germany, USA, Japan and other countries. The statement that our collection of classical Russian painting is really of a high value can be proved by the fact that most of the researches on history of Russian art include the analysis and estimation of a great number of the pictures from Kazan museum as important landmarks in the main line of the development of Russian painting. That can be said, for example, about the "Portrait of Merchant A.I.Borisov" by D.I.Levicki. It enchains the spectator with the harmony of noble colours and with golden light softly as if from the depth of the picture illuminating the face of a clever, intelligent and soft-hearted man. We also must mention the collection of a famous landscape painter, the native of Volga-Kama Region, I.I.Shishkin, especially his last painting "A Small Glade" which is considered to be one of his best works, and "Iphigenia in Tauras" from the hand of great V.Serov, the canvas filled with the feeling of veritable historicism and also bearing a hint of mystery in it, which awakens the imagination of the spectators. The museum collection of Russian avangardism is also very valuable for the research work on the problems of the development of the modern art. The works of the "beginners of the modern art" has become long ago the classical example of the XXc. culture; and the Kazan museum is proud of owing really outstanding paintings by P.P.Konchalovski, M.F.Larionov, P.P.Falk, I.I.Mashkov and such masterpiece of the world level as "Sabbath" by N.S.Goncharova. 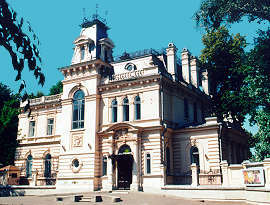 The museum owns also an absolutely unique collections of paintings, such as the collection of works of N.I.Feshin, a Kazan-born artist, first part of whose life passed in his native city and the second - in USA. The best and the largest collection of the works of this highly talented painter including not only portraits, which are very deep in their imaginary force and virtuous by their technique, but also the main of his genre paintings the "Slaughter-house" and "Showering with Water" belong to our museum. The State Museum of Fine Arts of the Republic of Tatarstan is ready for any kind of co-operation planning to popularise its collection. The financial support for the publishing of a general catalogue of our Russian collection and albums of the best exhibits of the museum collection would give an opportunity for people in many countries to get acquainted with those beautiful masterpieces. The collection of Tatar fine, decorative and applied arts in the State Museum of Fine Arts of the Republic of Tatarstan is one of the most unique in Russian Federation. It represents the art of Tatar people from the period of Volga Bulgaria (X-XIIIcc.) up to the retrospective of the modern (XXc) arts. The famous patterned leather boots ("al-bulgar") made in a complicated technique of a ''leather mosaic'' were well known far from the borders of Volga Bulgaria. The goldsmiths of Kazan Khanate were famous for there skill and many of the Russian chroniclers were enraptured by their marvellous jewelry. The original national jewelry created in a most delicate technique of a ''knobbly'' filigree is well represented in the collection of Kazan museum. The specialists are amazed by the type of decorative art which existed only among the Moslems of the Volga Region - ''shamail''. Those are the wall panels with Koran texts, painted on glimmering glass with golden or silver background in which the elements of Arabian calligraphy and multicoloured ornamental pictures are combined. Not less interesting are the other types of decorative art: red and white patterned weaving, home-weave rugs, worked with gold thread and chain-stitch embroidery. The national school of painting offspring only in the 20-th of the XXc., thanks to the direct influence of the Russian painters, mainly of the teachers from the Kazan School of Fine Arts (opened in 1865). B.Urmanche (1897-1993) was one of the founders of the national fine arts. His canvases of the 20-th became classical for the modern art of Tatarstan. The creative works of such painters as H.Yakupov, K.Fattakhov, N.Kuznetsov, V.Malikov, V.Kudelkin, I.Zaripov, A.Abzgildin and others exhibited in the department of modern arts in the State Museum of Fine Arts of the Republic of Tatarstan became inseparable part of multinational art of Russia. The collection of the Medieval Russian painting in the State Museum of Fine Arts of the Republic of Tatarstan is a small but significant part of the great treasury of the Russian culture. It is represented by the wonderful art monuments of the XVI-XIXcc. The world of images, created by the Medieval Rus painting is wonderfully peculiar. This peculiarity is determined by the Medieval epoch - the epoch when the only dominating ideology was the religious thinking, when all the phenomena of the earthly life were examined and understood by people in the light of Christian religious mythology. The Italian landscape engravings of the XVIIIc. are represented by G.-B. Brustoloni series based on Canaletto's originals ''The Betrothal of the Doge with the Sea'', depicting the Venetian festivals and 100 etchings by Luigi Rossini from the series ''The Roma Antiquities'' (first quarter of the XIXc.) and by genre of ''pictorial journeys'' in the French engravings of the XVIII-first quarter of the XIXcc., by the romantic landscapes from the canvases of Josef Vernet and some others. The art of classicism is represented by French academic artists of the XVII-XVIIIcc., by such brilliant masters as A.Coypel, C.Mellan, G.Edelink, B.Audran. The series of the ''king wall-papers'' created from Ch.Le Brune by S.Leclerc and the engravings by I.-C.Le Vasseur, G.Massard and others must be mentioned here. Among the ouvrages published separately stand out the full etching suite by F.Goya ''Capriccios'', two volumes of the ''Italian School of Painting and Drowing'' created by Italian engravers and published by Fr.Piranesi, three volumes by J.B.Oudry's ouvrages of the "Fables choisies..." of J.la Fontaine. We also own a small collection of French book illuminations of the XVIIIc. and ornamental-decorative engravings of the XVIII-XIXcc.